Water and electrical needs in the letterpress shop are generally modest. All but the largest presses typically use motors under one horsepower, and unless you’re processing your own photopolymer plates, you’ll use more water making coffee than letterpress printing. That said, there can be surprises and obstacles when dealing with older industrial equipment. Badly done plumbing will cost money and may cause rust if it leaks. On the other hand, badly done electrical work can kill you, thus the first and most important rule: if you don’t understand and have experience with electricity, don’t mess with it. Hire an electrician or find a knowledgeable friend to help (and teach) you. Unless you’re lucky enough to be building your shop from scratch, where the water is and where it goes is likely to be predetermined. If you’re processing your own polymer plates, you may want to set up your space so that the platemaker and the water are in the same darkenable space. While many types of photopolymer don’t require darkroom level darkness, setting up a space that has a closable door will also help with dust considerably. If you happen to be running typecasting equipment that requires water for cooling, the situation becomes more complex. Getting water to machines is often easier than getting it away. Remember that any drain lines need at least a 1/4 inch of drop for every foot of length and that if there is a direct sewer connection, venting and a trap are required (as is inspection in most cities). As an alternative, many founders employ closed coolant systems in which a mixture of water and anti-freeze is circulated through the caster, then a simple heat exchanger, ending up in a reservoir from which the coolant is once again pumped to the caster. There is no discharge to worry about. HP (horsepower): Is a measure of the power output of the motor. Most “studio” size presses can be driven by fractional (under one horsepower) motors. It’s only important if you’re replacing the motor, or if the motor seems undersized. Duty: Indicates the amount of time a motor can be on in one usage. Press motors should be continuous duty. 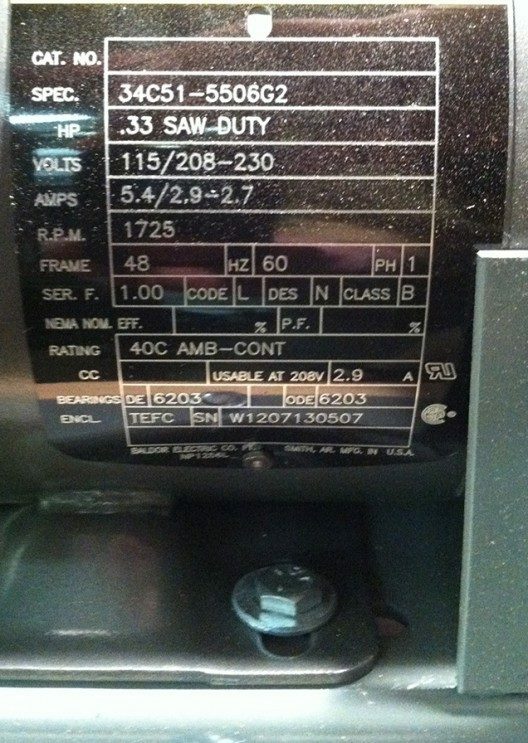 Volts: The voltage required for the motor. If there are two numbers or ranges given, i.e. 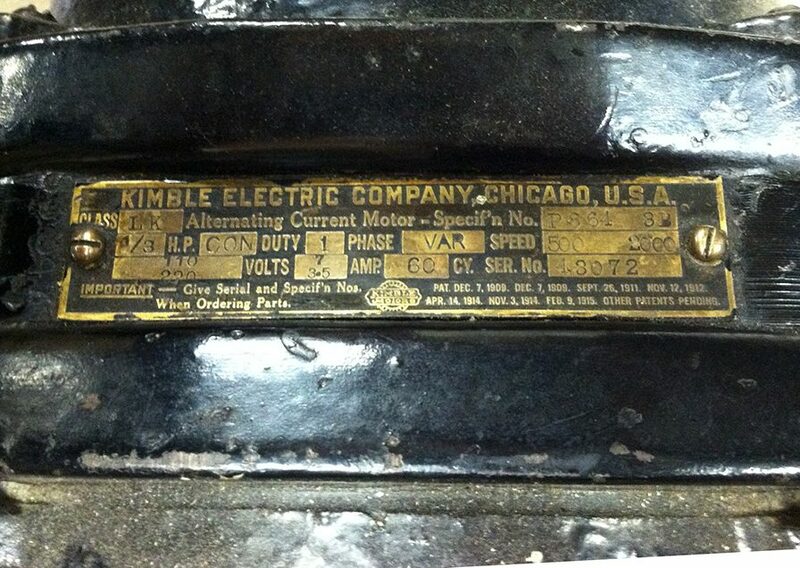 110/220 or 115/208-230, the motor can be wired for two different voltages. The higher voltages (nominally 220) use less power. Amps: Is the amount of power the motor draws when it is running. The combined amperage of the devices running on one circuit shouldn’t exceed the the rating of the circuit breaker for that circuit. On a dual voltage motor the will be dual amperage ratings as well. Phase (PH): Single or three. Three phase power is not typically available in residential areas. Cycles or HZ: North American standard is 60 hertz/second, other parts of the world use other standards. The cycles specified on the motor have to match the current coming out of the wall. Speed or R.P.M. : The speed of the motor in revolutions per second. Most commonly fixed at 1725 or 3450. Frame: Is a electrical industry standard for the size and hole pattern of the motor mount. It’s important if you’re replacing an existing motor. Also note that these have changed dramatically over the years, and you may want to consider repair over replacement for this reason. Encl: Means “enclosure” and specifies the motor case. If you have a choice, look for “TEFC” which stands for Totally Enclosed Fan Cooled. This style of case is the most resistant to dust and moisture. Once you’ve determined the motor specification you can determine your power needs. Ideally, the circuit that powers your press will be separate from the one that powers the lights. It needs to be of sufficient amperage to run all the devices that you may have on at one time. While in commercial shops presses are often hardwired directly into the building wiring, in most home shops/studios a cord and plug arrangement is probably better. If the press is hardwired, you’ll need a disconnect of some sort at the wall to isolate the press from the building electricity. This is a switch that goes in between the press — even though the press should have it’s own off/on switch — and the building wiring. If your press motor is three phase, things get more complex. In most situations you’ll have to either get a phase converter that creates three phase power from single phase power, or convert the press to a single phase motor. (Three phase power usually has restricted availability and is only installed in commercial and industrial areas.) You can find a discussion of phase converters in this Wikipedia article. Remember that if you are running three phase all the switching has to be appropriate for that power system.